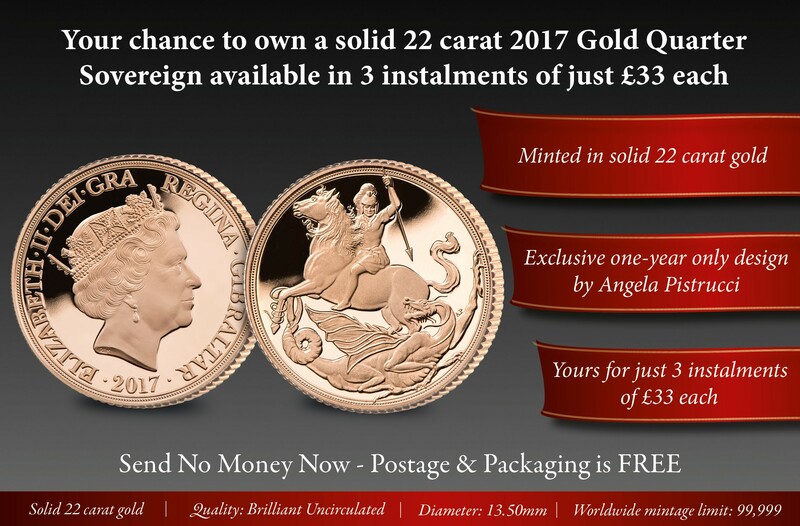 Gold sovereigns are highly sought after by collectors around the world and this 2017 solid gold Quarter Sovereign is certain to be no exception. You now have the opportunity to own this prestigious 2017 Quarter Sovereign featuring a modern depiction of Saint George the Dragon. In its 200th anniversary year, Angela Benita Pistrucci, great-great-great-grand niece of original designer Bendetto Pistrucci, has now remastered a stunning version of her ancestor's original design. Exclusively available to you from The London Mint Office, this Brilliant Uncirculated Quarter Sovereign pays tribute to a masterpiece. Limited to just 99,999 worldwide. Order now to avoid missing out.